Understanding the process whereby fishing capital accumulates and excess capacity emerges, particularly in fisheries where incentives for race to fish and race to invest are present, and where capital is not perfectly malleable, remains an important topic. We develop a dynamic model, incorporating quasi-malleable capital, race to fish and invest behaviors and myopic expectations, in which the level of excess capacity is endogenously determined. 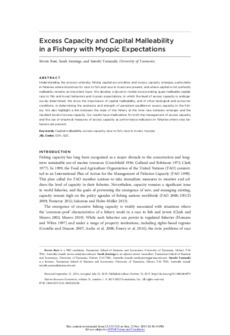 We show the importance of capital malleability, and of other biological and economic conditions, in determining the existence and strength of persistent equilibrium excess capacity in the fishery. We also highlight a link between the state of the fishery at the time race behavior emerges and the resultant level of excess capacity. Our results have implications for both the management of excess capacity and the use of empirical measures of excess capacity as performance indicators in fisheries where race behaviors are present.